IS IT ANOTHER MODERN RENAISSANCE OR SUBCULTURE? 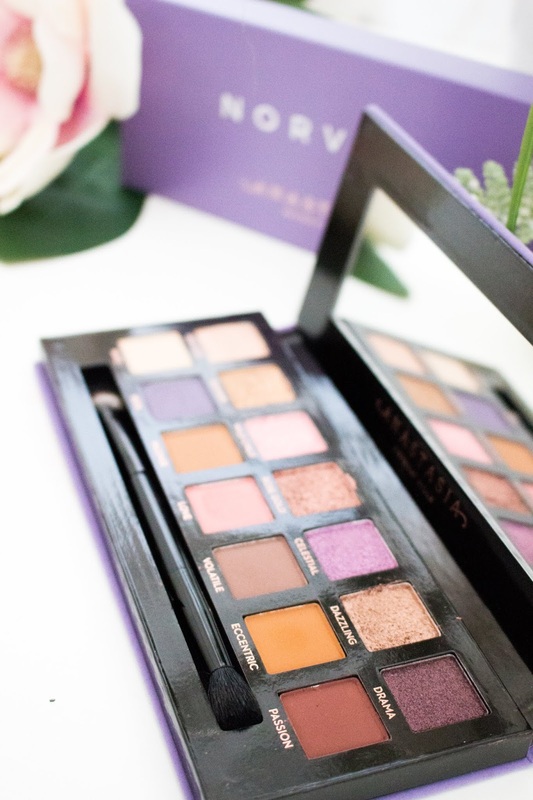 If you look back at my blog over the last year then you will notice that whenever a new Anastasia Beverly Hills eyeshadow palette is released, I will purchase it and then review it. I have all of the latest ABH palettes besides the Prism palette that came out during the Christmas period last year ... however I do own the other three Modern Renaissance, Subculture and Soft Glam! So, when I saw that ABH were bringing out a new palette called Norvina, I signed up to the waitlist on BeautyBay and purchased it the day after it was released. I have had mixed feelings towards ABH eyeshadow palettes in the past; I am a huge fan of the Modern Renaissance and Soft Glam palette but Subculture was a palette that didn't work as well (unless you were living under a rock last autumn, then you will be well aware of the controversy that surrounded that palette). 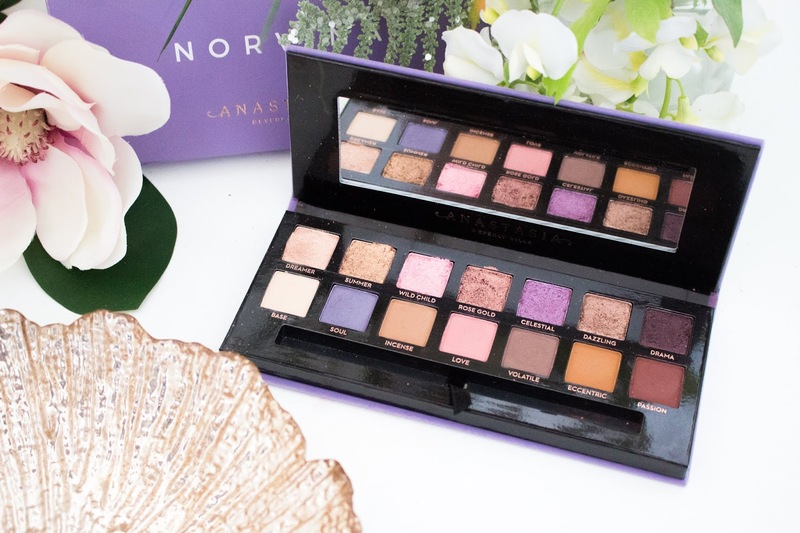 At first, I wasn't sure whether I was going to buy the Norvina palette as it is not a palette that usually fits my criteria of being full of either neutral shades or warm-toned peach and coral shades. A purple palette is not something that I would naturally gravitate towards ... in fact it is something that I would usually skip altogether. However, something just made me want to buy it as I loved the fact that there was a row of shimmers and a row of mattes and I wanted to buy a palette that was a bit more out of my comfort zone ... especially as I am not planning on buying another palette for a few months (as I own so many that I barely use). I was really hoping that this would fall under the Modern Renaissance expectation in regards to formula rather than the Subculture! 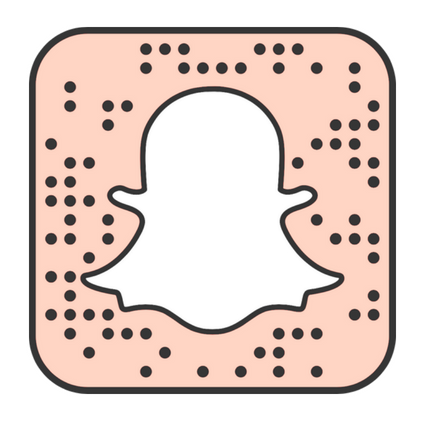 And there is only one way to see ... and that is by trying it out and giving you my honest first impressions! The Anastasia Beverly Hills Norvina eyeshadow palette retails for £43 or $42 from Anastasia Beverly Hills, Beauty Bay, Ulta and Sephora. I could not wait to open this palette as soon as it arrived a week or so ago and I have been testing it out for the last week to really see whether this palette is worth you spending your money on. The packaging is identical to all the other palettes that they have brought out ... with the velvet packaging, the duo-ended brush and 14 shades. I do wish that ABH would change up the packaging every now and again as it can get a bit boring ... but, hey, why change something when they don't have to. If you own any of the other eyeshadow palettes, then you will know that although the velvet packaging feels lovely it gets dirty so quickly. Hence, why I have to take photos of the product before I have even swatched it as the velvet just seems to pick up every single little grain of eyeshadow! 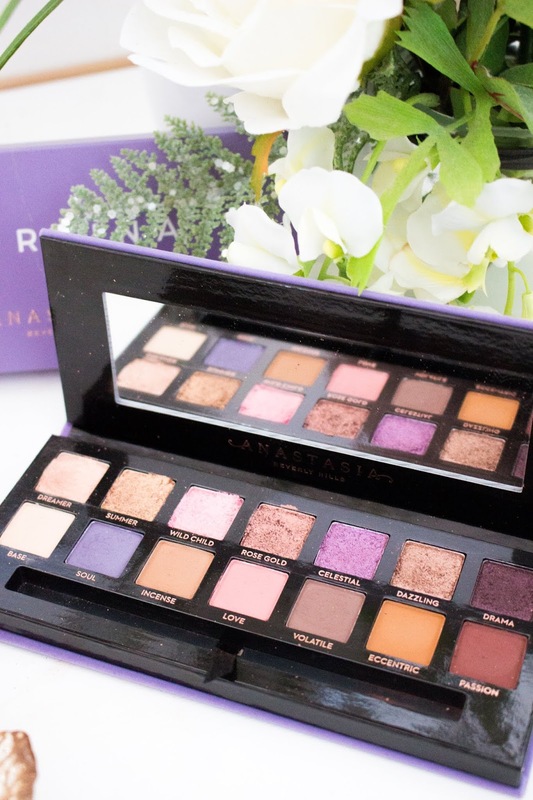 I love the purple packaging but it is quite simple and would love it if they just changed up the way their palettes look ... either by changing the shape or adding something to the outside packaging to make it look more interesting, rather than just having the name of the palette. This palette, like all the others has 14 shades in it that come in matte, metallic and duo-chrome finishes. 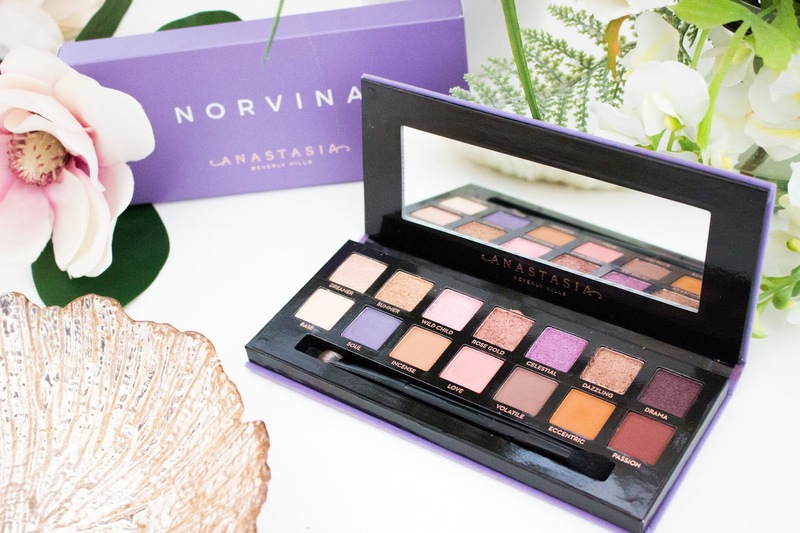 It is full of Norvina's go-to shades that include bright purples to more pastel shimmers! 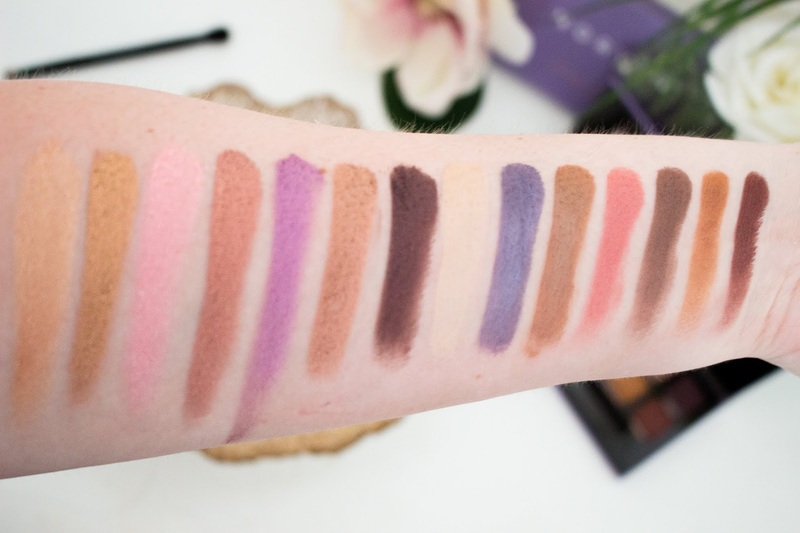 I am not someone who would usually go for purple eyeshadow too often, but now looking at the palette it is not as bright as I thought it was going to be - I definitely feel like they have muted the shades to make them more wearable. I really think this is a palette that I am going to have to play around with quite a bit to see what shades work best with each other, but there are so many tutorials out there that can help me out! 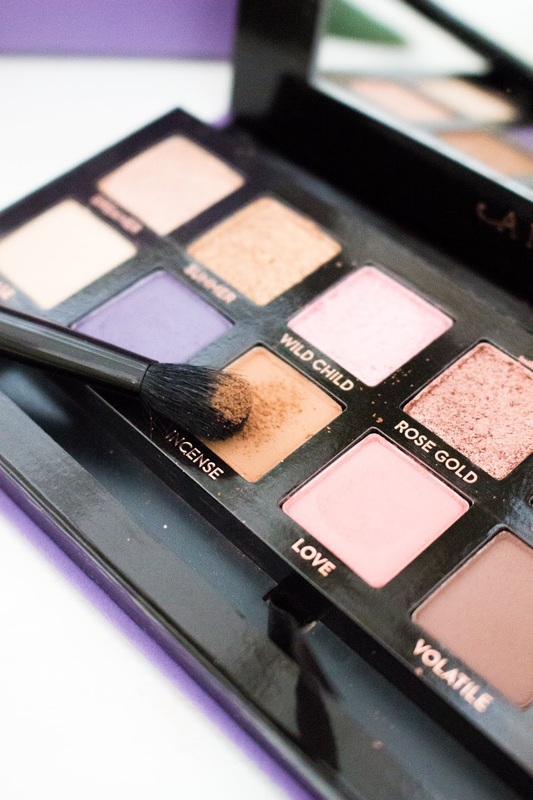 Plus, there is definitely a few shades that can be put together to create a more natural, bronzed eye look as well as going for the more purple shades of the palette. I thought there would be a lot more purple toned shades but in fact Anastasia Beverly Hills have been very clever and incorporated a couple of more bronze shades that can be worn everyday. Also, the shades are not as bright as I thought they would be, so I definitely think the shades are more wearable. In this palette there is a row of 7 highly metallic/shimmer shades and the bottom row consists of 7 matte shadows. My only problem is that two of the matte shades, Soul and Love seem to have a slight sparkle to them which I can only see in person but when I swatch them I can definitely see some sparkle but it is not too intense. Although, I wish they had just made those two shadows completely matte! So, the big question that some of you might be asking will be ... Is the formula more like Modern Renaissance or more like Subculture? In fact, I would say it is somewhere in between. I know so many people have already reviewed this eyeshadow palette and stated how much they love it (and I definitely fall into the category), however, there are definitely some good and bad points that need to be discussed when it comes to the formula of this palette. The pigmentation of these shadows is insane ... they are so highly pigmented and I found it so easy to swatch all of these shadows with just one swipe. The only shadows that I struggled with was the shades Wild Child (a metallic pink) and Celestial (a metallic purple). I found that these two shades were quite sheer and needed to be built up quite a bit to get the intense pigmentation I was looking for. However, the rest of the shades are so pigmented and look stunning on the eyes. I would definitely recommend using MAC Fix+ or some sort of setting spray to apply the metallic/shimmer shadows so that you get the most intense pigment, however they apply just as well with your finger! The matte shadows are also really pigmented, so you don't need to have too much pigment on the brush. Just remember that it is easier to build up the pigment than to try and blend out a lot of pigment at a time! My only criticism and what makes it similar to Subculture is the amount of kick-up there is when I put my brush into the pan. These shadows are so soft and really do have quite a bit of kick-up ... which is just reminiscent of Subculture although I wouldn't say it is as bad. You definitely won't hit pan with these shadows after a couple of uses, unlike some people who did with the Subculture palette, but it is something to note that they do cause a bit of a mess ... so a light hand is definitely needed when picking up pigment. I would also recommend doing your eyeshadow before applying your foundation as I did notice some fall-out under my eyes. Therefore, if you apply your foundation afterwards then it is much easier to clean up the fall-out than if you were to do your foundation first. I love the formula of these shadows; they are so soft and buttery but blend really easily. Some of the shimmers are quite crumbly so do have some kick-up but it is nothing too serious and they work well with a wet, synthetic brush. The shadows also blend out beautifully, although I did notice that the shade Soul took some more work than the other. However, the rest were easy to blend out and I was able to create a gorgeous look very quickly. To make blending even easier, I would definitely use a concealer or eyeshadow primer first to just make the shadows more intense and to help blending. Base is the perfect setting shade for me because it is not far off my skin tone, especially in the autumn/winter months when I am at my fairest. I love how many looks you can come up with, with this palette - you can go more neutral, then go with the pastel shimmers, or have a brighter purple makeup look. This would definitely make a great palette to take with you if you were going to a festival. I think this palette is so wearable ... however, my concern was about creating looks. It took me a while to figure out what shades I thought would work well together. Therefore, I would definitely recommend checking out some makeup tutorials on YouTube to see what shades look good together, especially if you do not feel confident coming up with looks. I will be posting some looks on my Instagram very soon, so follow me on there so you can see them when I post them. I definitely think this palette is worth buying. My only criticisms were that the packaging gets dirty, there is some kick-up and fall-out and it is quite tricky to think of what shades work well together. However, most palettes end up getting dirty, most palettes will have some fall-out and kick-up and there are multiple makeup tutorials that you can look at or even go on Instagram for inspiration on what shade work well together. I think the formula is great and is very pigmented, blends beautifully and those metallic shades look almost like foiled shadows on the eyes (especially when using something like MAC Fix+). The shades themselves are so far out of my comfort zone but they have been slightly muted to make them more wearable and I think they will look stunning in the fall/autumn months. 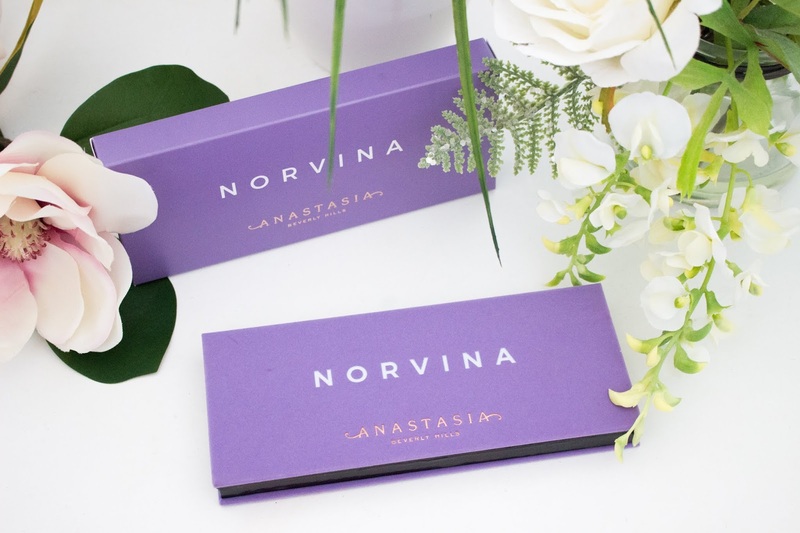 I think if you love previous ABH eyeshadow palettes then you will definitely love this and it is something that they have not really done before. This is the perfect festival eyeshadow palette! Let me know in the comments if you have this palette and what your thoughts of it are? 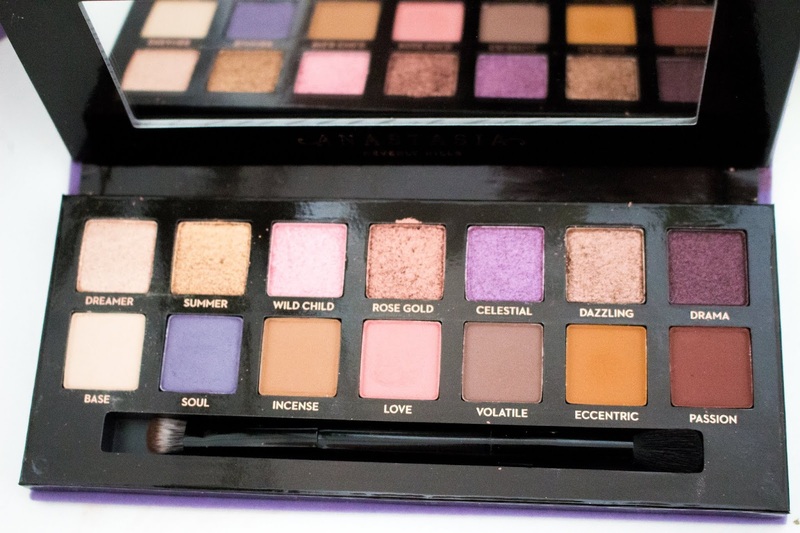 Are there any palettes that you are absolutely loving at the moment?